YARD OF THE MONTH! 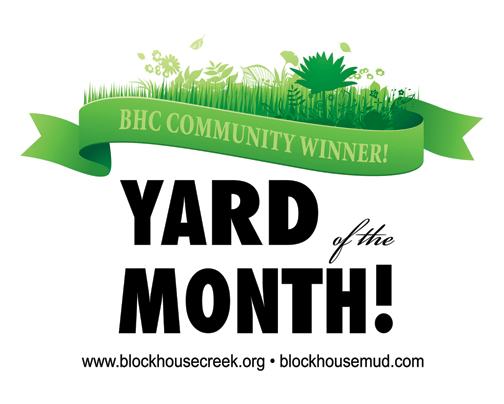 Soon, your Owner’s Association Maintenance and Safety Committee will begin recognizing outstanding yards throughout the Block House Creek community for the month of August! You can nominate your own yard, your neighbor’s yard, or any yard district-wide to be recognized. The yard of a potential winner doesn’t necessarily have to be the greenest yard. The Committee will be looking for well-maintained, neatly edged yards as well as for xeriscaped yards with native plants. Four winners will be named each month, June through August. Winner’s will receive a $50 gift card. We can’t wait to hear from you. Make your nomination via the Block House Creek Owner’s Association website, www.blockhousecreek.org, home page, bottom right.